Blurb: A group of three young thieves are pulled into a centuries old magical war between ancient beings, mages, and humanity in this wildly original debut epic fantasy. Wow, if this isn’t on your To-Read list already, I’d highly recommend rectifying that error, because friends: this book is unlike anything I’ve ever read. Most notably for me, honestly, is the way this book is written. It’s in such a different style and voice than what I’m used to, and it did take some getting used to. I’m not sure if I can really describe it, but it feels like it sort of blends narration and stream-of-consciousness style (or perhaps train of thought) all into the same sentence, yet you’re not confused when you reach the end of it? I’m not even sure if that’s right or what is actually happening, but that’s how it felt to me. As such, I really had to focus when reading this novel. 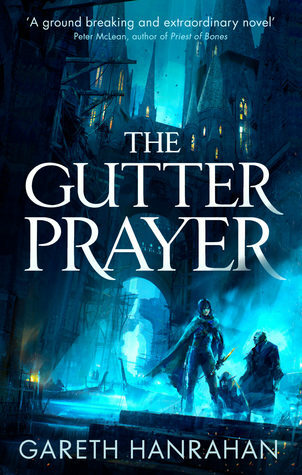 I’m usually pretty good at tuning out the world and reading in any environment, but I needed quiet and solitude when reading The Gutter Prayer. Everything was so purposeful, from the way it was written, to the details described, to the order in which the information was given. I couldn’t afford to be distracted, by anything, lest I missed something important and ruined my understanding of the story. Can we get more covers in this gorgeous blue, btw? Please? I think I have to continue with my theme of purposefulness. Every character played a role in this story, every single one. There were no throwaways and that was seriously powerful. Add in the fact that you’re seeing multiple perspectives from all different sides of power and suddenly, you have your feelings and opinions being tugged back and forth, your opinion never safe from being altered, shocked or your heart suddenly ripped out. Finishing this book, I feel both a little numb from how powerful and unexpected that ending was, but also slightly exhausted; like I actually experienced the weight of Cari’s journey alongside her, instead of simply reading about it. Don’t get the wrong impression, though. After that ending and that last line, you can bet with 100% certainty I’m absolutely sitting over here, baited breath, to see what happens next. It was a beautiful story, prolly one of the most creative I’ve read. The creatures, the way society was built around them and the religious beliefs; the depth of the lore was just so real and I couldn’t get enough of it, truly. Some of it was so dark, too (and we all know how much I love dark), to the point that I was actually revolted, thanks to a single line (and I am almost never moved to such a response, so that alone is impressive). I seriously don’t believe I can review this novel and do it justice. I definitely feel like I’m just talking in circles (so thanks for reading and sticking with me anyway). It made words like “intricate” and “depth” feel not grand enough to be proper descriptors, with characters who were fresh and vibrant and real, yet so burdened and broken, I couldn’t help fall in love with them. I was awed by creations like the Tallowmen and the Crawling Ones. And I don’t think I’ve ever read a book where the information was presented at the perfect time, without a hitch. There were a lot of plots working together and every execution of information to push those plots forward or tie them together was flawlessly done. It was just…an incredible book; one that I feel I’ll have to reread multiple times to truly do it justice. This is an author you’re not going to want to miss. Absolutely not. Previous postYear of the Asian Reading Challenge! Loved this review. Seems like it really hit you on an emotional level and something more. I agree! I am still trying to finish it, but it’s such incredible worldbuilding I’m reading slowly to absorb every word. Lovely review! I definitely think I’ll take my time more on the sequel, now that I know what to expect. I’m so excited to read your thoughts on it. Thanks, Tammy! I thought this was a great book. The world-building was incredible and might have overshadowed the other aspects of the novel, but overall I still loved it. Yeah, I thought it was pretty incredible, too! I need to go back and read your review! Okay, I really need to read this one. I’ve been anticipating but after reading your review I know it’s a priority to-read. Yours is the second positive review I’ve seen of it, and now I can’t wait to read it! Ohmygosh, JOLIEN. That is such a compliment, you have no idea!! Thank you so much. I seriously would love to know what you think, because we seem to have pretty similar tastes, whenever I read your reviews. I hope you’re able to read it soon! Ohmygosh, that means so much to me, you have no idea!